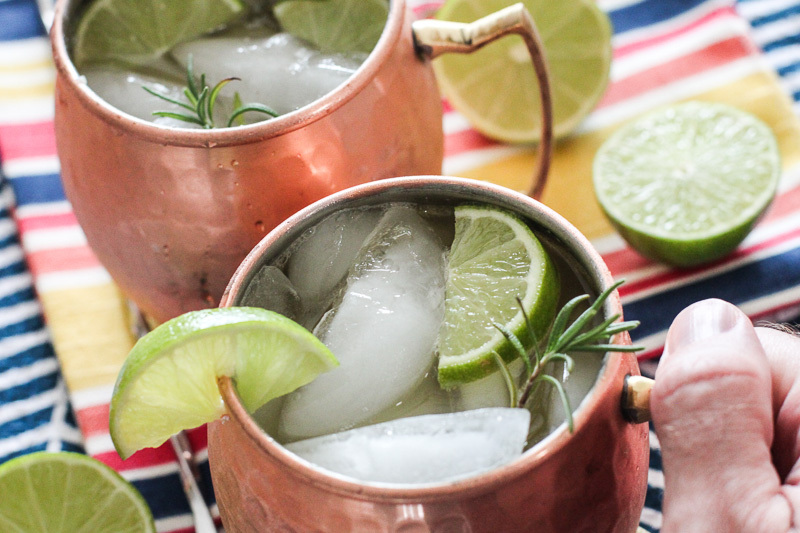 Kombucha Moscow Mules are perfect for summertime and always a crowd pleaser! It’s officially summer and being Wisconsinites, we know we need to maximize the next three months. For us that means spending as much time outdoors as possible. Each week, we look forward to lazy Friday evenings on the deck with a refreshing beverage. 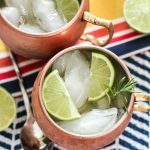 Moscow Mules have become extremely popular and you’ll find them on cocktail lists at many bars and restaurants these days. However, you simply can’t beat making one at home. You can pick the highest quality and freshest ingredients and customize it to your tastes. Add some fresh herbs or seasonal fruits and you have the perfect summer cocktail. 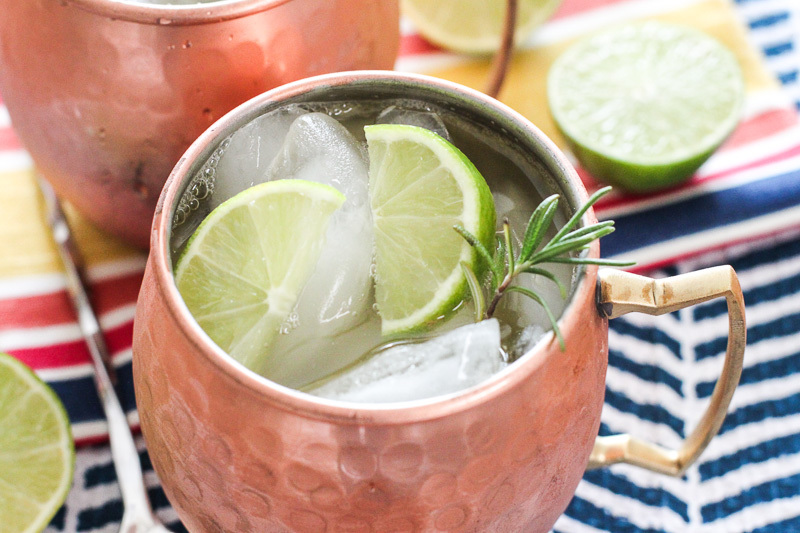 Our favorite way to customize our Moscow Mules is to substitute ginger kombucha for ginger beer. Many ginger beers are made with artificial flavorings and high fructose corn syrup, so substituting for ginger kombucha is an easy way to make your cocktail cleaner. This means less chance of a headache or that “meh” feeling the morning after you’ve had a few drinks. Fresh herbs – rosemary, mint or basil are great options! In a cocktail shaker, combine ginger kombucha, vodka, lime and ice and shake until chilled. Strain into a copper mug and fill with ice. Garnish with a lime wedge and fresh herbs of your choice! Don’t have a cocktail shaker? No worries, simply add the liquids to your mug, stir to combine and fill with ice. *You can also omit the vodka for a delicious mocktail! Of course, it’s not a proper mule unless you are using a real copper mug. The beautiful mugs you see in this recipe are 100% pure copper (lined with nickel for your health and safety) and available from Moscow Muled. And a special thank you goes out to the friendly folks at Moscow Muled for sending these my way! Beat the summer heat with a refreshing Kombucha Moscow Mule! Fresh herbs rosemary, mint or basil are great options! In a cocktail shaker, combine ginger kombucha, vodka, lime and ice and shake until chilled. Strain into a copper mug and fill with ice. Garnish with a lime wedge and fresh herbs of your choice! Don’t have a cocktail shaker? No worries, simply add the liquids to your mug, stir to combine and fill with ice. Man, this post is making me envious. I’ve TRIED to make kombucha so many times and it’s a miserable fail EVERY SINGLE TIME. I would buy it but the cost is just too high for our family budget. This sounds divine though. Oh no! Feel free to email me and maybe we can troubleshoot as to why you aren’t having any luck. I am happy to help! This is so perfect! I brew my own kombucha and this looks awesome! Oh awesome! What is your favorite kombucha flavor to make at home? 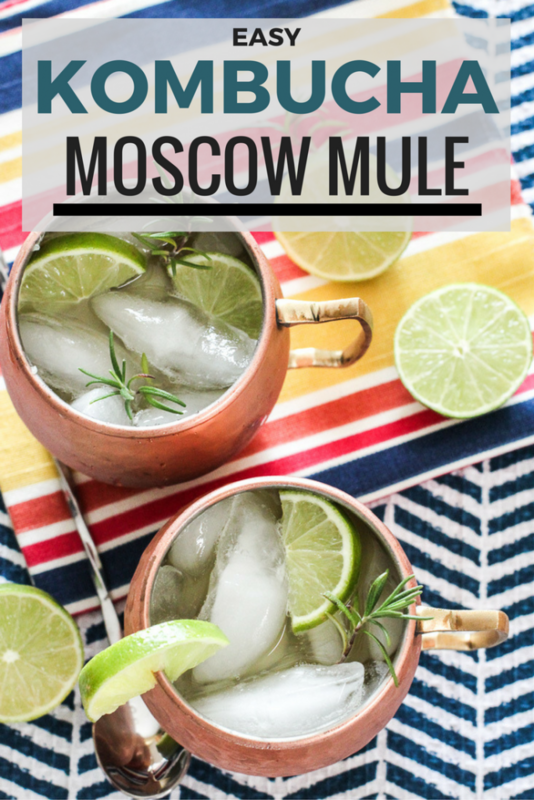 I absolutely love moscow mules, I haven’t had one in a while, but it is literally the only thing my friends drink! I’d love to surprise them with one of my own using kombucha. I am absolutely going to try this the next time I have some kombucha on hand. Thank you very much for this recipe! Hope your friends love it!